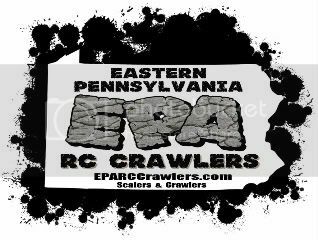 EPARCCrawlers has proudly partnered with Rausch Creek Off Road Park to bring radio control rock crawlers into the world of full size rock crawlers. We will be hosting a 2.2 Pro or 2.2S and Class 2 at the same time the big boys are holding their comp. this will be a very unique experience, since we will literally be side by side on their crawling course. The event being held is the RCrocs Eastern Rock Crawling Competition. This event attracts some top notch full size trucks to compete at Rausch Creek. Rausch Creek Off Road Park is devoted to providing a fun legal place for 4x4 off road clubs and organizations to go "wheeling." The park consists of almost 3,000 acres of easy, intermediate, and hard trails. Rocks, bowls, hills, the glacial "Rock Creek", club friendly trails, and free on site camping combine to make Rausch Creek a unique 4x4 experience. Food and drinks are available at the park. There are also restrooms, covered eating areas and electricity for charging batteries or running small tools, if needed. There is primative camping available. If you are interested the club will be camping over from the 15th to the 16th. We will be doing a night scale run and some practice the night of the 15th. Please read and follow all the rules for Scale and Comp. Crawlers. Read closer, OR. If we have time and the judges and course builders are up to it we could get all three classes in. A option of all 3, always excites me! So who is all coming?? Need Help planning an event to raise money for breast cancer.